Expedition travel is all about shared experience and collective knowledge. A gathering of individuals with endless stories of adventure that cross the divide between generations, only to find a mutual appreciation of the journey each has made to arrive at the furthest corners of the globe. 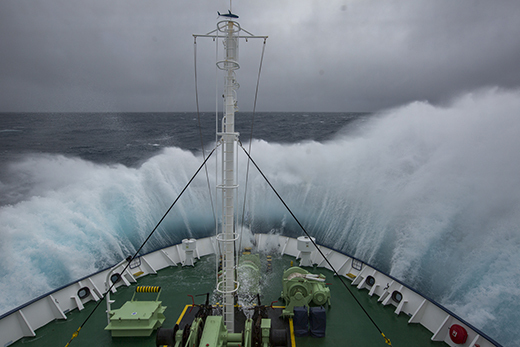 The Sub -Antarctic islands are remote, unforgiving, vulnerable, yet filled with life that thrives. Despite the harsh elements that create challenges for those that inhabit the region, life has found a way to exist and more importantly adapt and become one of the most productive and dynamic ecosystem on Earth. 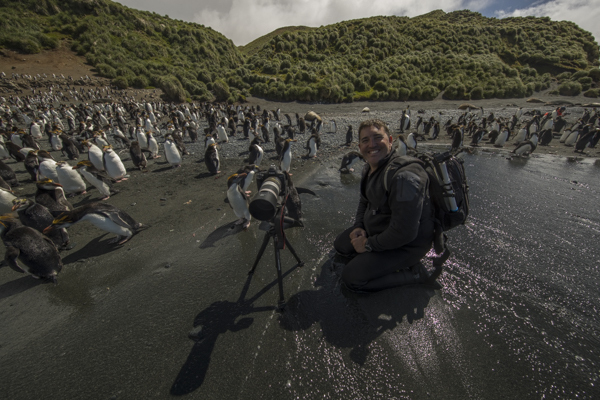 The jewel of the Sub-Antarctic region is without a doubt the impressive Macquarie Island. Situated at latitude of 54” 30’ South and Longitude of 138” 55’ East, the rugged mountains, lush green landscapes, eclectic flora and diversity of wildlife species, make this a world class destination sort by many but visited by few. 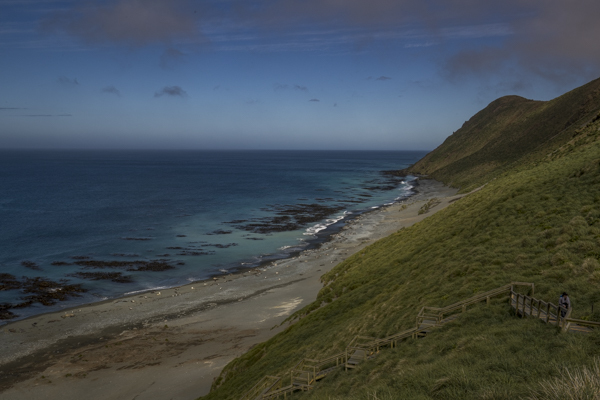 Today, Macquarie Island is listed as a World Heritage Area, which is managed by the Tasmanian Parks and Wildlife service as a Nature reserve. 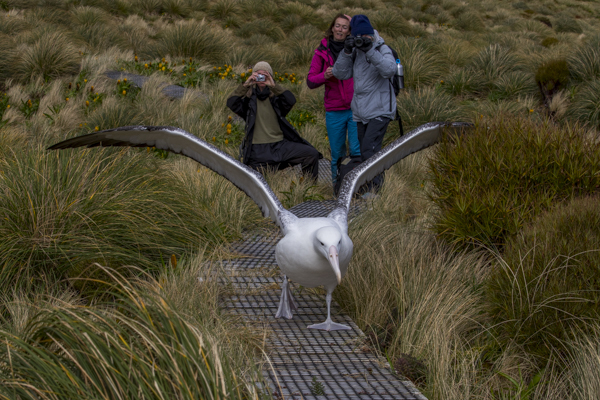 During any visit to Macquarie Island you are accompanied by a Parks ranger to guide you through the specified areas. Many of the rangers have spent 6 months or more on the island running research programs and managing these natural resources. Vastly knowledgeable the team impart their experience and understanding of this delicate environment, bringing the past and the present into focus. 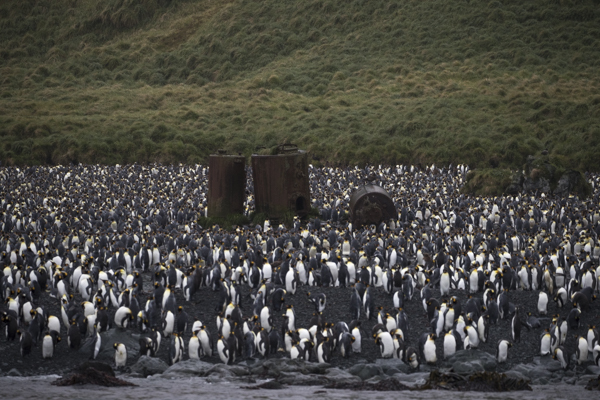 Literally thousands of animals leave the marine environment to mate, give birth and feed in the nutrient rich Sub-Antarctic sanctuary of Macquarie Island. 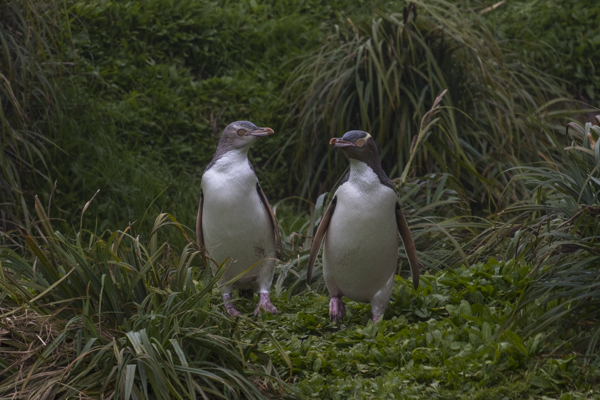 Four species of penguin including King, Gentoo, Royal and Rockhopper, breed on the island and congregate in large numbers all along the coast line. Penguins have developed specialised physiology to withstand the extreme cold of the Sub-Antarctic temperatures. Their feathers are tightly packed and have a layer of blubber to keep them insulated. They are the perfect design for this part of the world. A first glimpse of the penguin colonies from the ocean heightens the visual senses, followed by the sounds of thousands of penguins before your sense of smell is awakened by the pungent odour of the colonies drifting on the ocean breeze. The sheer numbers and space they inhabit across the island is indicative of the thriving populations. 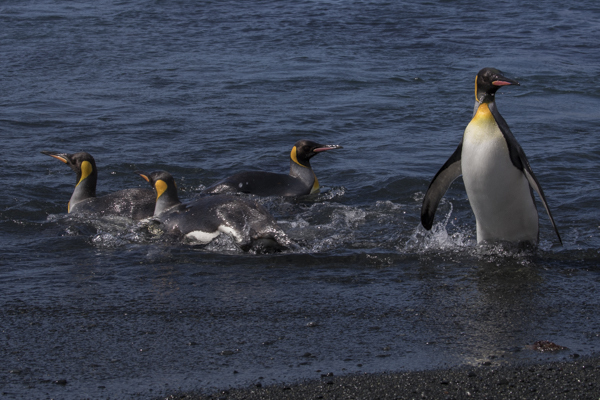 King Penguins are probably the most iconic part of Macquarie Island and represent the pristine environment that has become a sanctuary for the many penguin species coexisting in this remote Sub-Antarctic island. These penguins are the reason we were here. After many months of permit applications and expedition planning, we were about to get in the water to photograph these majestic marine birds. However, this would prove to be a challenging task. 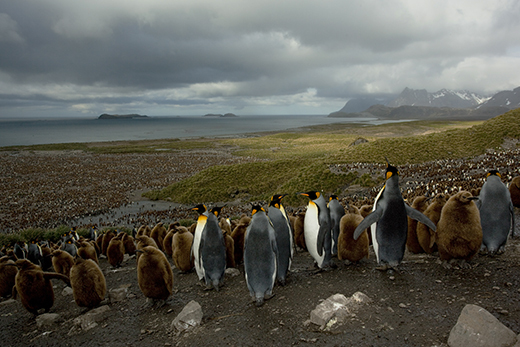 The King penguins stand at just under a meter and can weigh up to 12kg on average. On land they move reasonably slow as they make their way from the ocean to their colonies at the base of the mountain range. In the water they move at high speeds and can be difficult to track as they quickly change direction leaving a trail of bubbles in their wake. 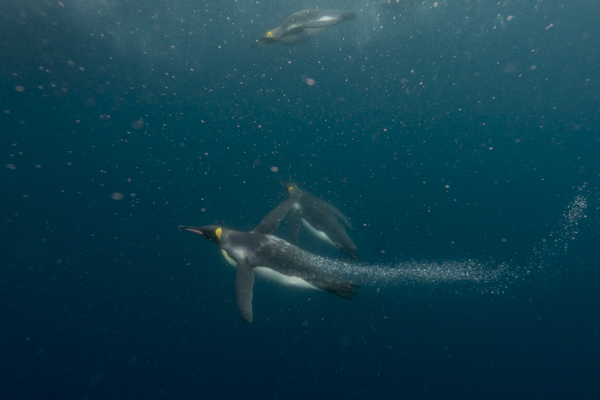 On top of this, our time was limited so we had to determine where our best opportunities to photograph the penguins underwater might be. Finally, we noticed some rock pools where the King Penguins were entering before coming to land. Carefully entering the water, we moved to the back of the rock pools as the penguins entered the pools from the Southern Ocean. 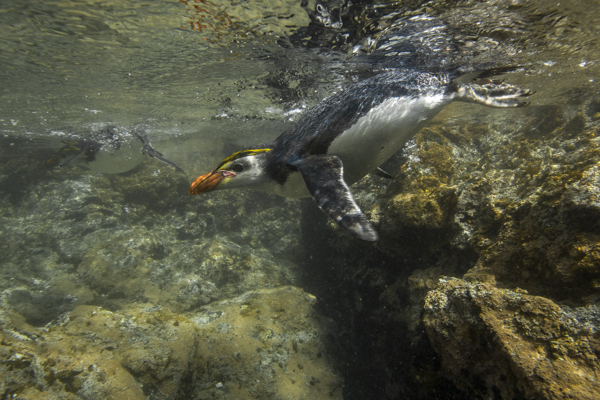 The pools were small, but the penguins demonstrated their agility as they zipped around the rock pools before leaping out to dry land to continue their march back to the colonies. The Royal Penguins seemed much more curious in the water and would often come in closer to investigate the camera. 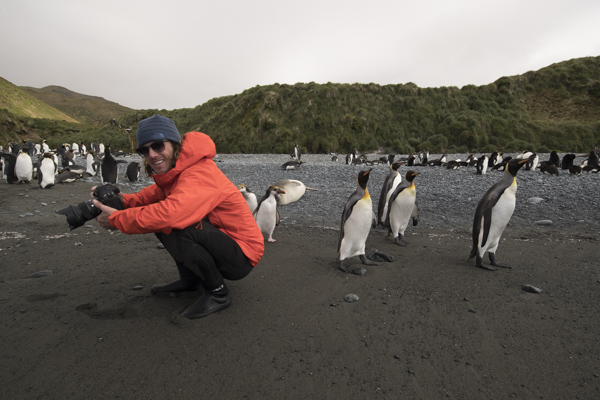 The curious Royal penguins are endemic to Macquarie Island of which is the largest colony found only on this remote stretch of land. Royal penguins only breed on Macquarie Island and it is estimated that population numbers are more than one million pairs. I must admit, I fell in love with the Royal penguins, they had personality and their overtly curious nature made them even more enduring. Deliberate in their actions, they would often come in for a closer look and surround me as I sat on the beach absorbing everything around me. With no real predators on land they were confident enough to interact with anything or anyone that came their way. Truly a unique experience. Lusitano Bay off Macquarie Island, was a haven for king penguins, the sheer numbers in the water were remarkable, let alone the colonies that shrouded the coastline. Hundreds of penguins rafted along our zodiac’s, curious enough to see what was going on and take a break from their daily foraging duties. Nonetheless, King penguins still dominate the landscape and travel great distances to search for food to feed their young chicks. 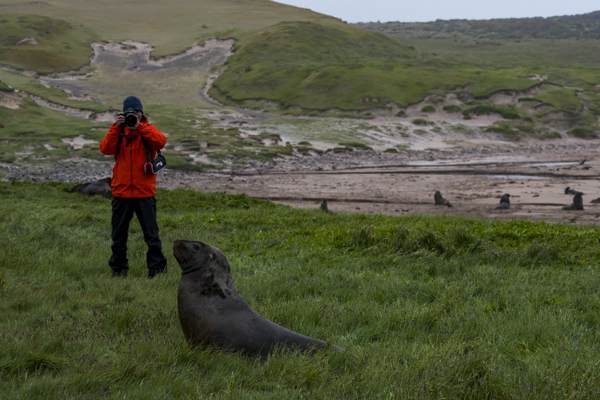 Elephant seals also line the beaches of Macquarie Island and they are a dominant presence across the sub Antarctic regions. 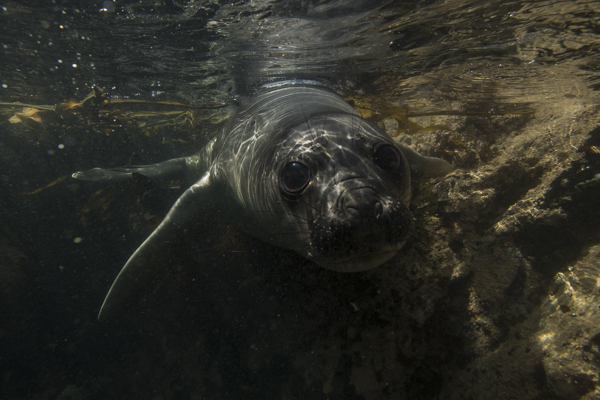 An era of exploitation saw the seal populations decimated between the 1800s to early 1900s, and the Southern Elephant seal numbers decreased dramatically during this period. However, a rapid recovery after the cessation of sealing saw an increase in numbers to over 60,000 individuals. 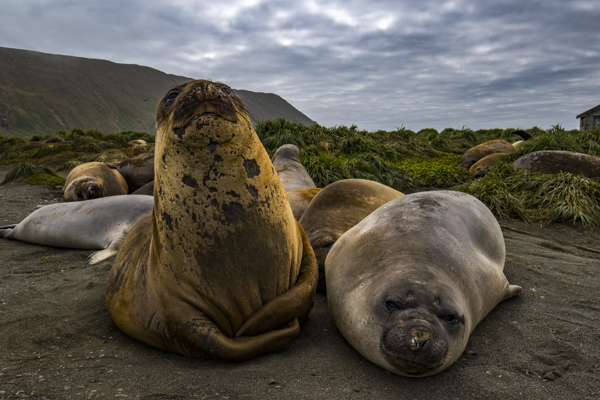 The breeding season of Southern Elephant seals on Macquarie island begins late August and females usually come ashore approximately a week before giving birth. Pups increase in size from the fat rich milk from their mothers and the weaners can reach up to 200 kilograms in weight in less than 3 weeks. These charismatic youngsters are thigmotactic and will look for any opportunity to nuzzle up to a warm body. Probably one of the most engaging animals you could meet, baby elephant seals are the embodiment of cuteness and very interactive. Their big affectionate eyes are endearing, and they have no fear. Adult elephant seals during the mating season will fight with each other for dominance of the beach where they defend their harem of females. These battles between beachmasters can be bloody and brutal. The males have the overpowering urge to mate and will corral a group of females and spend their time defending their fleeting dominance of the harem. It is a constant battle for position, which sometimes ends in severe injuries to the loser. 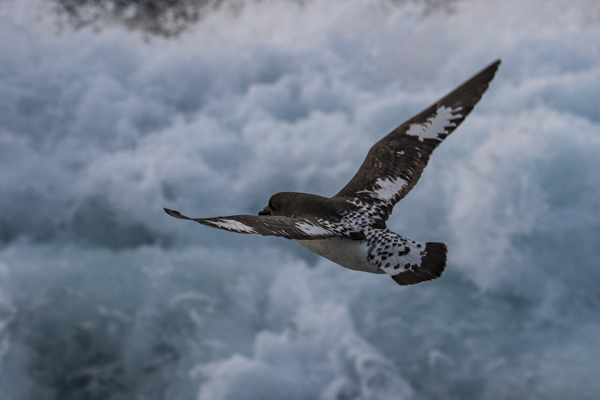 The Sub-Antarctic is home to a myriad of seabirds, too numerous and varied to define in a typical species but more an evolutionary tale as new species is identified each year. 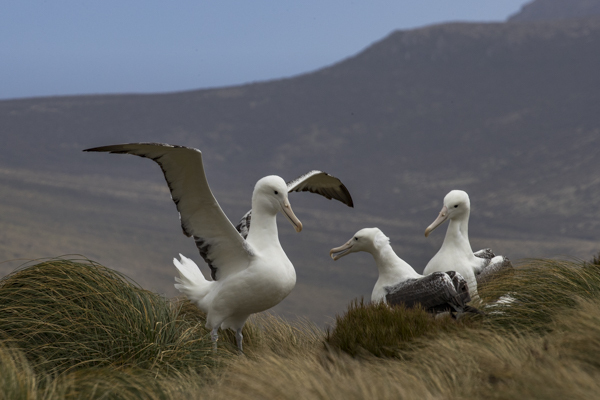 The Southern Royal albatross is only found on Campbell and the Auckland Islands and nowhere else in the world, an endemic species that is the second largest of the Albatross species on the planet, with wing spans up to 3 meters. The Southern Royal albatross has a repertoire of breeding behaviours including synchronised preening and calling, bill clacking and the language of dance. As the sun heads towards the horizon in the afternoon hours, the sound of gliding birds coming into land dominates the skies above. Like 747’s coming in for a landing, these large birds will swiftly arrive to join the evening ritual. They undertake their dancing rituals in search of the appropriate mate. These rituals can last for years before a mate is finally narrowed down and chosen. To watch these rituals in all their glory and the intricate communications, that will eventually determine a mating pair, that will stay together for life, was truly fascinating. Wings expanded, vocalising and clacking bills these colossal birds put on an impressive display of sight and sound. 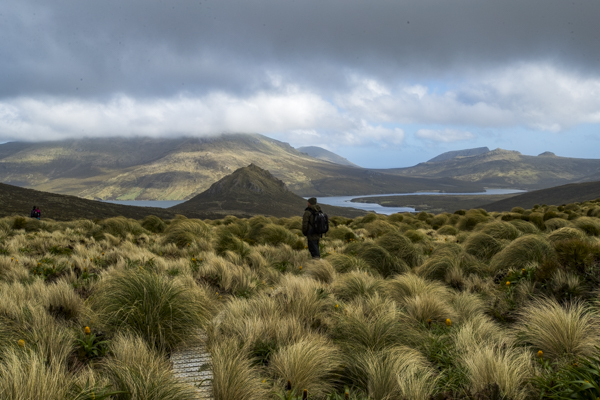 The nesting happens high up on top of Campbell Island, where we follow a 6km track through the spectacular inside valley of the island along a winding ridge of thick tussock grass until we reach the cliff tops that line the edge of the island. Harsh winds pound against the cliffs as the Southern Ocean demonstrates its power, moulding the rugged terrain of these emote island landscapes. At one point we walked the track to the sea edge as the wind pushed us back in retreat and the sea spray drenched us entirely. A clear reality of life in this part of the world. But despite the extreme elements the flora and fauna were abundant. Walking along the track there were fields of lavender megaherb, daisy, lichen and Bulbinella, with a myriad of colours stretching across the landscape. As we made our way through the thick tussock grass we were startled by Hookers Sea lions that had decided the view and the comfortable grass were better at this elevation. But as soon as we reached the Royal Albatross we had a whole new perspective on the landscape and these incredible birds. We spend the last remain daylight hours watching as rare albatross crossed our path in search of a mate. 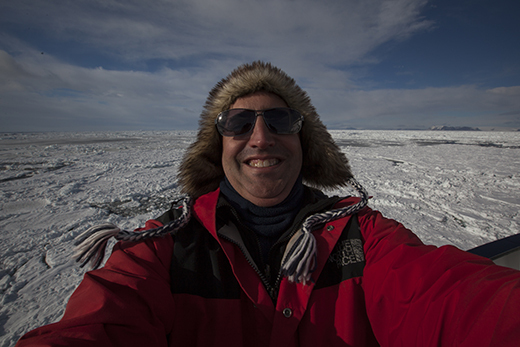 Bio Security is probably the most important factor when visiting remote isolated Sub Antarctica islands. Penguin colonies are vulnerable and susceptible to disease and other introduced contaminants, so the strict bio-security protocols in place help protect all the species from the spread of disease through human contact in the area. This process starts before you even step foot off the ship. We are summoned to the lecture room to partake in the vacuuming ritual. Each piece of clothing, camera bag, equipment etc is thoroughly vacuumed with a clear focus on dislodging any evidence of seeds that could be introduced to a pristine environment. Velcro is one of the worse carriers, so we carefully pick out anything resembling a seed or a foreign object. The next stage is submerging our boots in a sterilising chemical called Virkon, which is designed to basically kill any germ or bacteria, coupled with a scrubbing brush, this seems to be an effective system to keep these Eden’s disease free. We repeat the same process each time we get on and off the ship to ensure the integrity of all our gear. Planning a journey to film and produce such a rare series of images involves a great deal of preparation and coordination to ensure success. Unexpected weather conditions, unpredictable wildlife and potential risk of not having an accessible place to land can make things difficult. 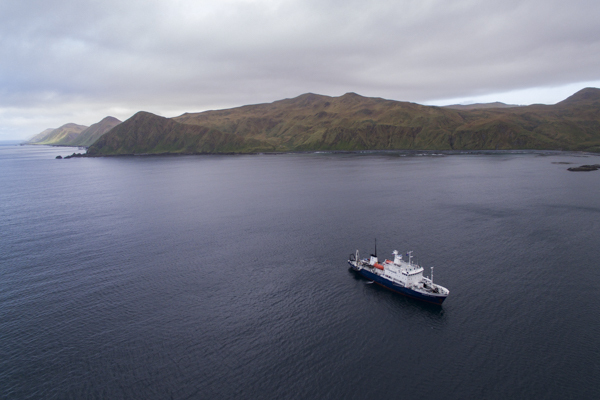 The Sub Antarctic is a harsh environment to work in but when you overcome all the challenges you realise how much of a privilege it is to be able to visit these remote parts of our amazing planet. 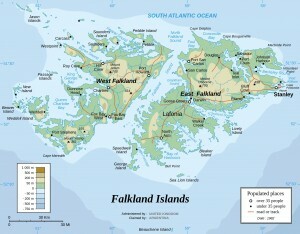 places on the map (just barely) but very few people have even seen these islands, let alone set foot on them. planet as the southern ocean pounds the coastline for returning penguins and seals. December sees Matt Draper & myself embarking on the trip of a lifetime, to film in one of the most amazing places on the planet. Thanks to Lenovo our major sponsor and the support of so many amazing brands, we are preparing for the rough seas, rugged environment and technology needs that go hand in hand with any expedition to this remote part of the world. These specialist itineraries are designed to maximise your time with some of the most unique wildlife on the planet. 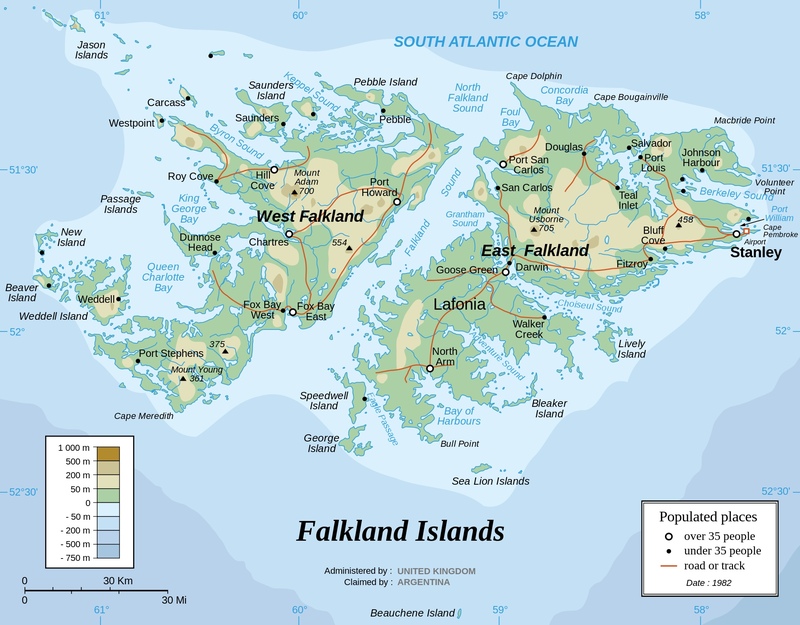 The Falkland Islands located in the South Atlantic Ocean off South America are the perfect destination to experience the wonders of nature and wildlife; an unpolluted environment with fantastically clear blue skies, seamless horizons, vast open spaces and stunning white sand beaches. So, I had the privilege of hosting the 2017 Rolex scholar Melinda Brown for a Month in Tonga. 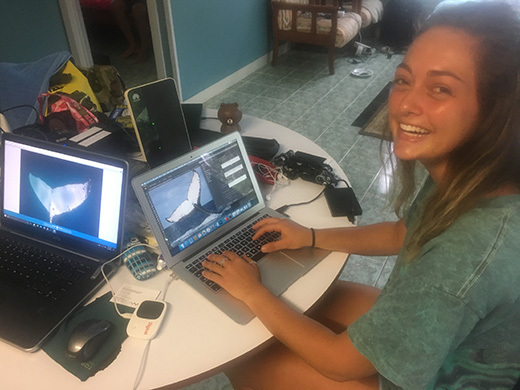 as part of her year long program she joined us for a month to work with me on the Tongan Fluke Collective, some coral gardening projects and plastic pollution education, oh and of course she came to swim with the whales. the time went fast but we did so much and I am glad she had the opportunity to join us on location.